Stock # 521627, 6.7L I6 Cummins Turbo Diesel Engine, Automatic, 152486 mi. 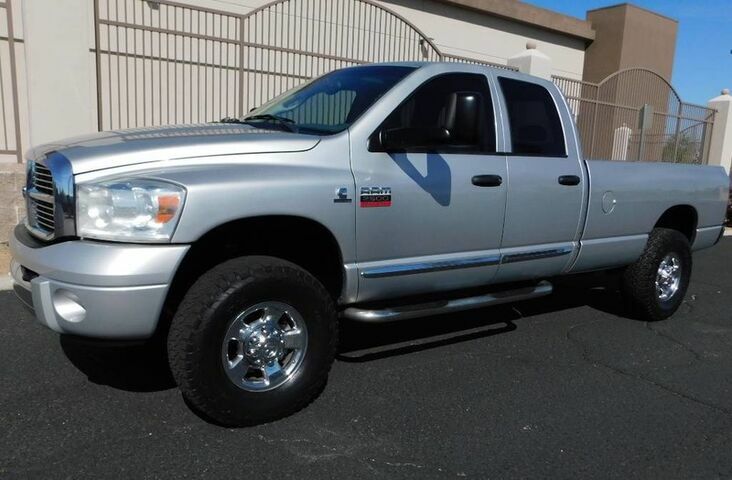 2009 DODGE RAM 2500 4WD with 152,486 PAMPERED miles. DON'T LET THE MILES FOOL YOU!! I truly believe this has to be the one of the cleanest 09s currently available for sale! This rig is hard loaded with all power options. It drives super straight and the steering is tight and true. This rig starts, shifts, sounds, rides and drives just like it did, when it was purchased new. 100% Bone Stock. Zero aftermarket performance changes. I'm confident you will be excited about the excellent condition this truck is in throughout. The AutoCheck shows this rig has been registered on the border of Arizona/New Mexico since day one. This means ZERO, ZERO RUST will be found. The sides/bed are laser straight and the paint still shines like new. This truck looks exactly as clean in person as the pictures show it to be. The interior is in amazingly perfect condition with no smoke or foul odors. The seat edge isn't wore out and no signs of wear can be seen on the leather upholstery. Everything works properly! No disappointment's with the cleanliness of this truck period. Not a wore out beater. Read our nearly 1,000 100% positive customer feedbacks! We have been selling on Ebay over 17 years and know what it takes to make a deal painless and we are a member of The Better Business Bureau with an A Rating. We are located minutes from Phoenix International Airport and will provide free ground transportation to our dealership. Please read the "Terms Of Sale" section. $299.95 Documentation Fee applies to all deals. Sales tax may apply.